After a cyclonic storm lashes Tamil Nadu, a crocodile about to lay her eggs, finds refuge in a forest near a coastal village. Ramu who lives in that village is considered strange because he loves animals and roams the forest to befriend them. He discovers the pregnant crocodile and watches her prepare her nest and lay the eggs. He is enthralled by the tender care with which she looks after her young ones. When the scared villagers discover the crocodile, they try to kill her. Ramu and his sister desperately try to save her without much success. Will Ramu fight the odds and suspecting villagers to save the crocodile and her children? This beautifully shot film inspires the love of nature and its inhabitants. Romulus Whitaker, born in 1943 in New York, has settled in India as an Indian citizen. He and his wife live in the outskirts of Madras running a Crocodile Bank as their primary activity. 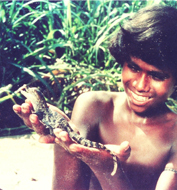 Whitaker is an internationally acclaimed herpetologist noted for his pioneering work among snakes and crocodiles and the snake-catching Irula tribe in Tamil Nadu. He has collaborated widely with film makers in India and abroad on films dealing with natural history ‘Cooperative for Snake catchers’ with Shekar Dattatri which won the 1988 National Award for the best scientific film. ‘The Boy And The Crocodile’ is his first feature film.